Natron Paper Bag with Motif "mmmhh"
The need for environmentally friendly packaging has skyrocketed in the last few years, driven by customer awareness and simple conscientious human awareness. A large swath of the prospective customer market will not even look at a product unless the packaging looks environmentally friendly and recyclable. Here we provide a large array of eco-friendly packaging to better represent your company's environmentally friendly dedication and approach to business. 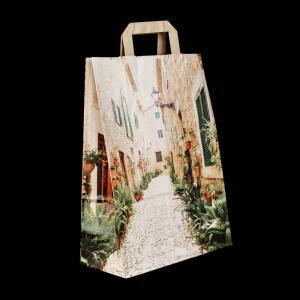 Here we offer a wide variety of eco-friendly packaging and bags that help to better represent your company's dedication and ecological approach to business. 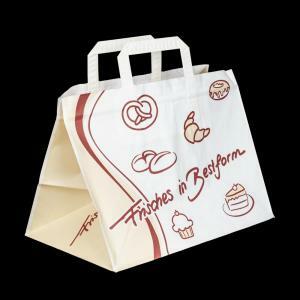 Made with kraft paper, greaseproof paper or cellulose paper, we have great looking cones / cornets, food wrapping paper, burger wraps, napkins for confectionery, bakeries and pastries, and beautifully attractive kraft paper bags, natron paper bags, & even with beautiful neutral print for all types of shops that enjoy a quick in-and-out movement of customers. Want to make your own packaging design? Have any questions? Give us a call or write us a quick note. 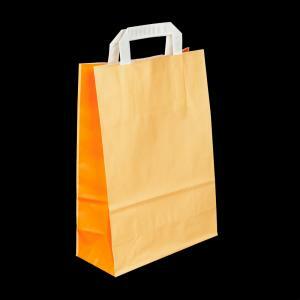 See also our Food Grade Safe Packaging for Commercial Shelf & Online Sales.